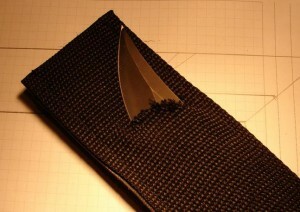 Sheaths are also used for knives, daggers, swords and other weapons like handguns and pistols. think in the relaxation atmosphere of buscrafters and survivalists whereby the knife a very important place takes of the gear. A knife never may get lost, damaged or wound the carrier. When you buy a knife, for example a Bowie or a buscraft knife it happens that the sheath that comes with the knife is of poor quality or even lives dangerously! With custom made leather sheaths made of 3,5 mil vegetanned cowhide you will not have this problem anymore. Custom handcrafted sheath, for Kabar 1217 the historical combat knife, made of 3,5 mil veg. tanned cowhide. Dyed in black and stitched in blue. Beltloop on dangler also stitched blue. Holster for Baikal mp 561 k multishot co2 pistol. Made of 3,5 mil cowhide and lined with pigskin. Dyed in cordovan and black. Stitched with beige. All handmade. Sheath for Mtech Extreme for horizontal use. With LMF Army firesteel loop. Made of 3,5 millimeter thick veg. tanned cowhide dyed in black. Totaly hand crafted. Sheath for a handmade competition chopper from Freerk Wieringa from Enschede. The sheath is built up of essentially 5 layers. Made of two layers of vegetable tanned 3.5 mm thick thick cow leather and 6.5 ml thick cow leather. The front is decorated with a layer of snake skin from an African Rock Python and over that a cut out layer of 3.5 millimeter thick cow leather. At the bottom of the sheath is a belt to attach it to the leg. The color is antique black and in combination with the snake skin and the color of the grip it’s a beautiful unit. This sheath is totaly handcrafted.